I have been writing about Tenement for quite some time on this site. I was lucky enough to stumble across them pretty early and have watched in amazement as they have taken on a life of their own over the years. Bruised Music Vol. 2 is the second singles compilation the band has released highlighting some of their songs that originally came out on various 7"s.
Granted, I have all of these 7"s, so there's only a couple of songs that I hadn't heard previously, but it blows my mind how well they all fit together in a full length album format. 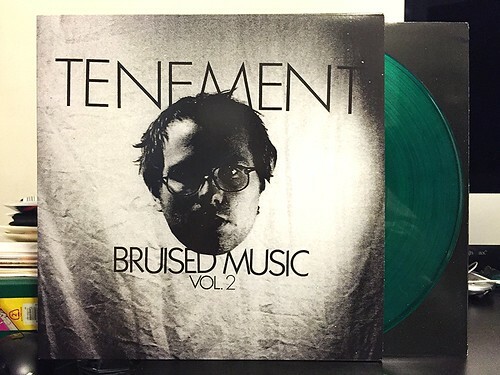 Much like Tenement's last proper full length, Predatory Headlights, Bruised Music Vol. 2 runs the gamut of Tenement's styles; from hugely recorded, catchy pop punk songs to lo fi, treble heavy numbers to a few of those weird soundscape-y songs that aren't exactly my favorite thing the band does. It is a remarkably diverse set of songs that for reasons I really can't explain coalesce into this perfectly formed body of music. You'd think they planned this all along. I'll always be partial to to the catchier Tenement songs like "Taking Everything," Paper Airplanes" and "Your Life or Mine," after all I did first hear about these guys on the Pop Punk Message Board. Tenement isn't a one trick pony, though. I think most have realized over the past few years that this is a pretty special band with many tricks up their sleeve. I'll keep buying their records to see what's next.